Play Frank Casino will then reward you with a bonus (Welcome Bonus is for new players only). The terms and conditions of the bonuses vary between different casinos and might also change over time and between different countries, so it is important to compare the different offers and read the T&C for Play Frank Casino before signing up. Play Frank Casino is a well-designed, elegant online casino with a clever website organisation owned by EveryMatrix NV Casinos. It was established in 2014, and in the four years it has existed, it has already accomplished much. The online casino is licensed by the Malta Gaming Authority and the UK Gambling Commission and is regularly audited for fairness by two independent testing agencies: iTech Labs and TST. Only the biggest of names among software providers supply Play Frank Casino with their freshest and most popular titles. From amazing slots and exciting progressive jackpots, to table games and specialty games, and the Live Casino by Evolution Gaming, Play Frank has everything you could ever wish for. Providers that proudly back it up are Microgaming, NetEnt, NYX Interactive, Play’n GO, Betsoft, as well as many others. Play Frank Casino is home to a plethora of clots. Seeing that so many highly respected providers supply it with their biggest game titles, it is no wonder that only the best slots are found in its lobby. You can enjoy some classic and already popular games such as Aliens slot, Gonzo’s Quest, Foxin’ Wins Again slot or Starburst slot, or you can have a go with the freshest additions to the library such as Hotline slot, At the Movies slot or Mr. Vegas slot. Play Frank Casino will also offer you numerous progressive jackpots. Play Frank Casino also has a wide selection of table games that will make your head spin. You will find the comprehensive list in the section marked by a lucky chip. Numerous variants of Roulette (American, European and French), Blackjack (Double Exposure Blackjack and Single Deck Blackjack) and sorts of Punto Banco/Baccarat can be played at Play Frank Casino. In addition, you can also try your luck with fan-favourites like Caribbean Stud Poker, Pai Gow Poker or Sic Bo, to name a few. If all that does not quench your hunger, there is a vast diapason of other possibilities at Play Frank Casino. You can play manifold variants of video poker, from classic ones to modernised versions of it, provided by NetEnt and GamesOS. Some of the games you can check out are All American Poker, Coliseum Poker, Deuces Wild, Jacks or Better, Shockwave Poker, as well as many others. Those searching for even more thrill, you can have a peek at the “Other” section on the website. There you will find even more games to have a go with. You can play various scratch games like 7 Gold Scratch and Tribble Knockout, as well as many versions of the classic Keno and more one of a kind games such as Lucky Wheel and Virtual RaceBook 3D. As an online casino supported by Evolution Gaming, it goes without saying that Play Frank Casino will have the ultimate Live Casino section on its website. This department was built especially for those you who are fond of real time, lifelike online gambling and cannot get enough of it. You will get what you need at Play Frank Casino! Enjoy dozens of diverse games and get the premium experience while facing a real dealer who will deal for you around the clock. Some of the games you can try are Live Baccarat, Live Blackjack and Live Roulette. For something a bit different, you can choose an automated machine that also deals 24/7. For more comfort and carefree playing, Play Frank Casino has provided dozens of banking options for you to choose from. You will never worry that your preferred payment option is not available, because basically all are. From more traditional options such as Bank Wire Transfer to various EWallets and mobile payment, to global banking methods such as Turkey Bank Wire and Dinero Mail, Play Frank Casino offers them all. For EWallets you might need to wait up to only 24 hours for withdrawal, while other methods might take up to 5 days, depending on the method. The withdrawal limit is 10 000 EUR per week, and the available currencies are Australian dollars, Euros, British pounds sterling, Norwegian kroner, Swedish kronor and US dollars. 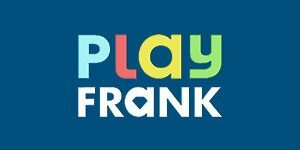 The customer service and support team at Play Frank Casino is yet another thing this online casino can be proud of. They are fully available through the Live Chat option 24 hours, 7 days a week, and not only that – they are also polyglots, who speak English, Swedish, Norwegian and Finnish, to give you more of an international feel. Other than contacting them directly and instantly through Live Chat, you can also email them anytime or fill in the online contact form if the matter is not urgent, and you will get a reply within the 24 hours.